Modern 3 Bed Detached House Set on a Generous Plot in a Pleasant Cul De Sac. 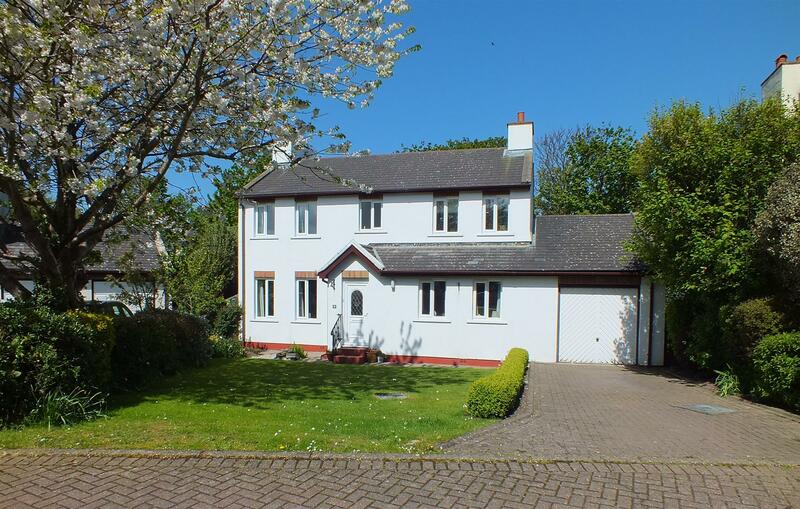 Walking Distance to Primary School, Play Park, Shop, Pub & Main Bus Route. Similar Floor Space to a 4 Bed - Offered in Excellent Order Throughout. Comprising Spacious Reception Hall with Cloakroom WC. Dual Aspect Lounge, Separate Dining Room & Study with Open Understairs Area. Good Size Breakfast Kitchen with Appliances Leading to a Large Utility Room. Spacious Landing and Family Bathroom with a Contemporary Styled Suite. 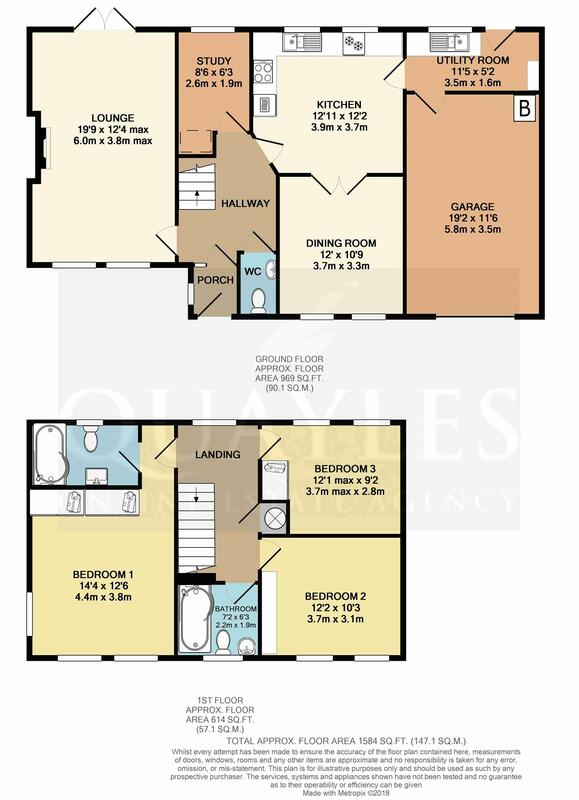 3 Double Bedrooms (Master with Built In Wardrobes & Stylish Bathroom). Wider Than Average Integral Single Garage & Off Road Parking for 2 Vehicles. Open Plan Frontage & Large, Private Enclosed Rear Garden with Patio. Travel into Ballaugh from Kirk Michael, taking a left turn at the hump back bridge onto Station Road. Continue along past the Spar/Post Office and primary school. Take a left turn into St Mary's Meadow and follow the road around where the property will be found on the left hand side. Having a part glazed and leaded uPVC entrance door and a side window providing further natural light. Solid wood flooring. Coved ceiling. Coat hooks. Glazed multipane door to the reception hall. A spacious area with two power points, a coved ceiling and smoke detector. Stairs lead off to the first floor. Fitted with a white suite comprising WC and a wall mounted hand basin. Mirror fronted wall cabinet. Extractor. A spacious, dual aspect room featuring a marble fireplace with an inset multi fuel stove. Two uPVC windows to the front. Patio doors over look and lead out to the rear garden. TV and satellite points. Coved ceiling with modern light fittings on touch control dimmers. A spacious room with dual uPVC windows to the front elevation. Coved ceiling with a modern light fitting. Clear arch to the reception hall. TV point. Glazed multipane doors open to the breakfast kitchen. A well planned room with dual uPVC windows overlooking the rear garden. Fitted with an excellent range of oak fronted wall and base units together with a centre island incorporating a breakfast bar, base units and drawers. Laminate worksurfaces with an inset 1 1/2 bowl ceramic sink with a lever mixer tap. 'Bosch' induction hob with a stainless steel extractor over. Built in electric fan oven. Integrated freezer and space for an under counter fridge. Background tiling. Brushed steel ceiling light. Oak strip floor covering. Door to the utility room. A useful space with a uPVC window and a half glazed door to the rear garden. Base unit with a 1 1/2 bowl stainless steel sink and drainer. Wall mounted cupboard. Plumbing for a washing machine. Part tiled walls. Tiled floor. Door to the integral garage. A larger than average single garage with an up and over door. 'Worcester' oil fired boiler. Consumer unit. Light and power points. Access to a part boarded attic space. A naturally bright and spacious area with a uPVC window to the rear. Built in cupboard with a high level linen shelf housing the 'Megaflo' pressurised hot water cylinder. Power point. Smoke detector. Access to the part boarded loft. Entrance area with a door to the bathroom and a clear arch to the bedroom. Space for a narrow shelving unit. Fully tiled walls complement a contemporary styled white suite comprising 'P' shaped shower bath with a glass screen together with a fully plumbed over head rose and hand held spray. Hi gloss vanity unit with a large top mounted basin and a push button flush WC. Heated ladder style towel warmer and shaver point. Additional towel shelf. Space for a freestanding unit or linen basket. 'Manrose' extractor. Obscure glazed uPVC window. Washed oak effect floor covering. A dual aspect, double room with three uPVC windows in total. Coved ceiling with a modern spotlight fitting. Measurement includes two deep, built in wardrobes each with a high level shelf and hanging rail. TV point. A double room with two uPVC windows to the rear. Built in wardrobe with hanging rail. Coved ceiling with spot light fitting. A further double room with two uPVC windows to the front. High level wall mounted storage units. TV point. Coved ceiling. Fully tiled walls complement a white suite comprising 'P' shaped shower bath with a glazed screen and fully plumbed shower, push button flush WC and a pedestal basin with an illuminated mirror above. Obscure glazed uPVC window to the front elevation. Heated ladder style towel warmer. Low voltage down lights and 'Manrose' extractor. Tile effect floor covering. Mostly laid to lawn with shrubs to the side boundaries. A driveway provides off road parking for two vehicles and leads directly to the integral garage. External PIR light and cold water point. Gated access to the rear garden. The large rear garden is primarily laid to lawn with a flagged patio. Well fenced boundaries. Shrubs to the borders. Raised beds. External PIR lighting and power point. Mains electricity, water and drainage. Oil fired central heating and uPVC double glazing.